a simple home style cabbage sabzi made with coconut and few spices. rinse and then slice or shred or chop 300 grams cabbage. also chop 1 green chili. keep aside. heat oil in a shallow kadai or a shallow frying pan. then add curry leaves, chopped green chilies and a pinch of asafoetida. stir and mix well. cover the pan with a rimmed lid. pour water on the lid. the water in the lid, creates steam in the pan and helps in cooking the cabbage. steam cook on sim or a low flame. do check the cabbage after every 5 to 6 minutes, by carefully removing the lid. in case the water dries on the lid, then add some more water and continue cooking the cabbage. if you see the cabbage getting browned, then sprinkle some water in the pan. usually the cabbage does not get browned. but depending on the type and quality of pan, the cabbage can get browned. when the cabbage is cooked well, then add 1/4 cup grated coconut. mix well and saute for a minute. switch off the flame. lastly add 2 tablespoon chopped coriander leaves. mix well. 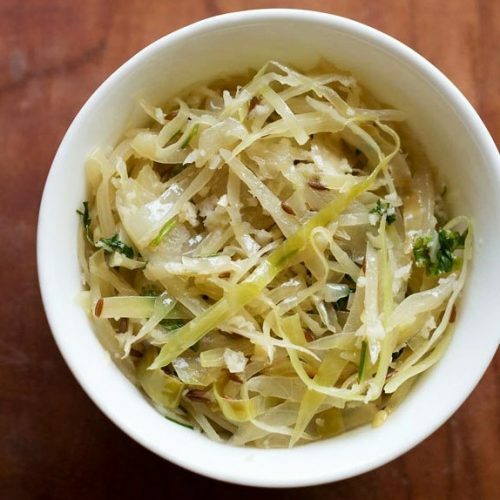 serve cabbage bhaji with chapatis or a side dish with any dal-rice or sambar-rice. instead of asafoetida, 3 to 4 medium garlic cloves can be used.